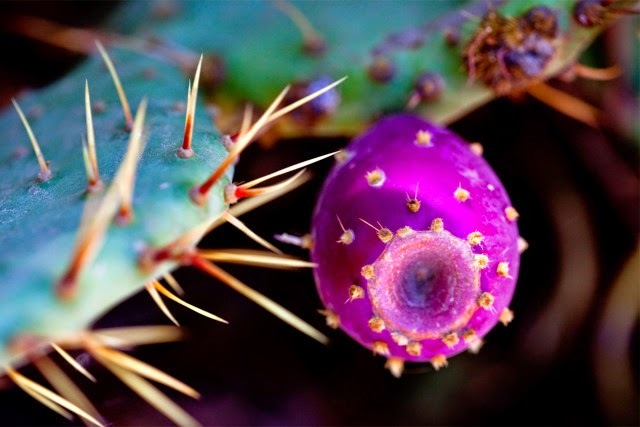 Prickly pears. 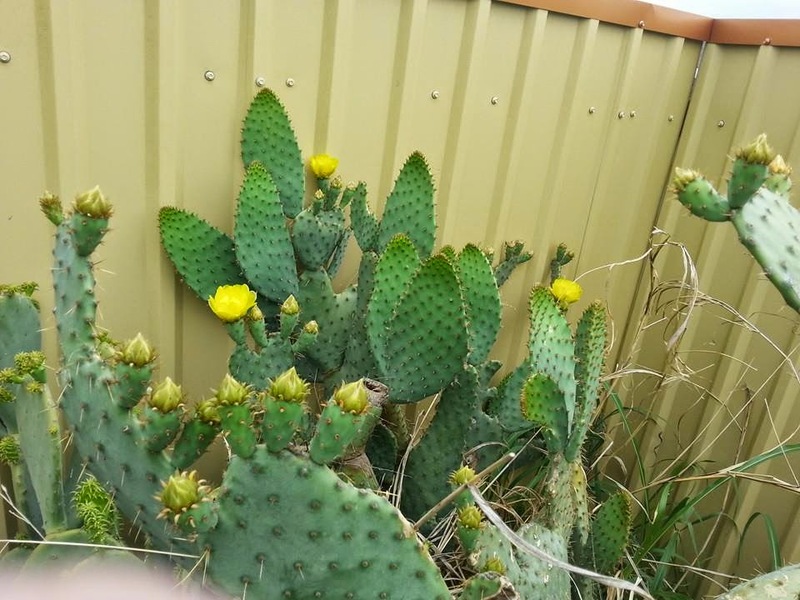 I had heard of them, never really knew what they were until Mikey insisted on planting cacti in one of the corners of the back yard. It took a couple years but the cacti got beautiful yellow blooms in the spring and then in the fall where the blooms were these pretty purplish pear shaped things appeared. Well duh! 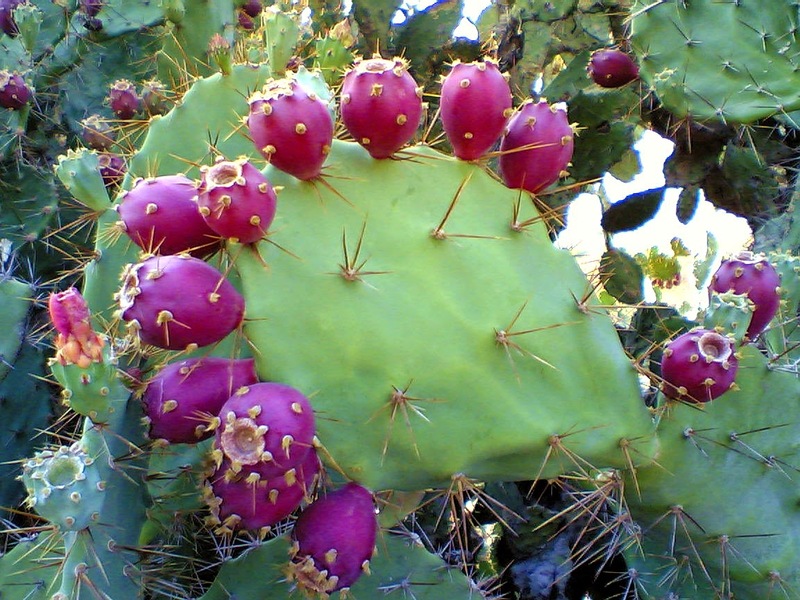 THOSE are prickly pears. Sometimes I'm simply not the brightest. For a few more years I admired the blooms and the subsequent fruit that emerged. This year there were quite a few pears. Guess it's time to use them. But how and for what? 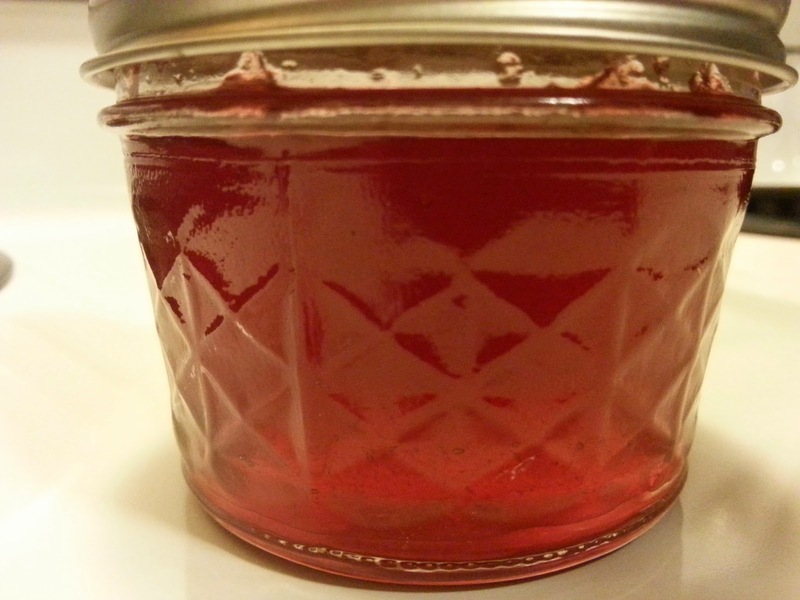 My lawn guy, whom I had recently made pear everything for, asked if I had ever made prickly pear jam. Hmm....okay, now I have something to make. I did some research and most of the recipes call for a long cook time. I wasn't that devoted and wanted to use Sure-gel. I've never had a jelly recipe to fail by using it and I feel secure with the outcome. 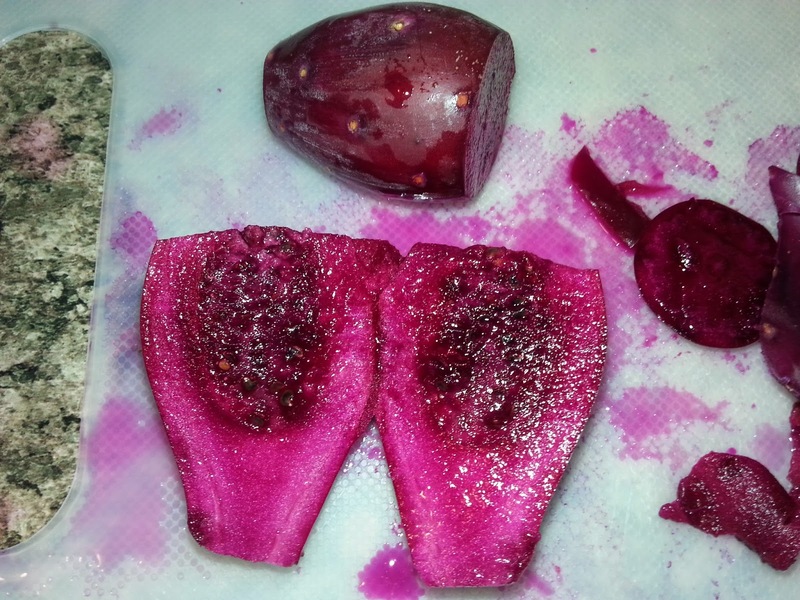 Finding a recipe for prickly pear jelly using Sure-gel was a bit challenging. Each recipe varied so much. So as usual I took what I knew with the ideas from other recipes and came up with the following. Let's talk about harvesting these little buggers! I had read to use a tongs and gloves. Okay...... "Honey...will you please go pick the prickly pears for me." Yes, that is how I harvested them. I shamelessly sent my poor husband out to face the demons. I did get brave with my little tongs and pulled a few off. Mikey however took the brunt of the brutal force that cacti deliver if they are disturbed. Yes, anyone can see the spines poking out with warning to not touch them. What you can't see too well are things called glochids. Those things are pure EVIL! Nearly invisible and hiding where you least expect them they will get you no matter how careful you are. I swear the cacti shoot them at you when you get even remotely close to them. REALLY close up. For those of us with bad eyes, you can't see these tiny little hairs. 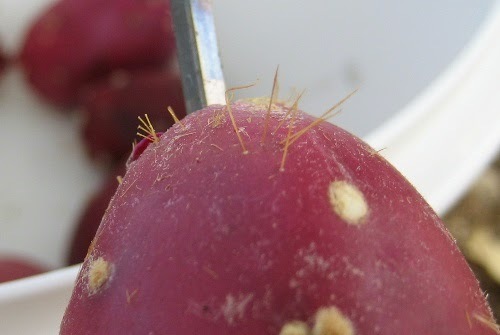 Glochids are hair like with barbs on them. They don't come as a single but bring all their little buddies along with them. They go deep quickly and are nearly if not completely impossible to remove. 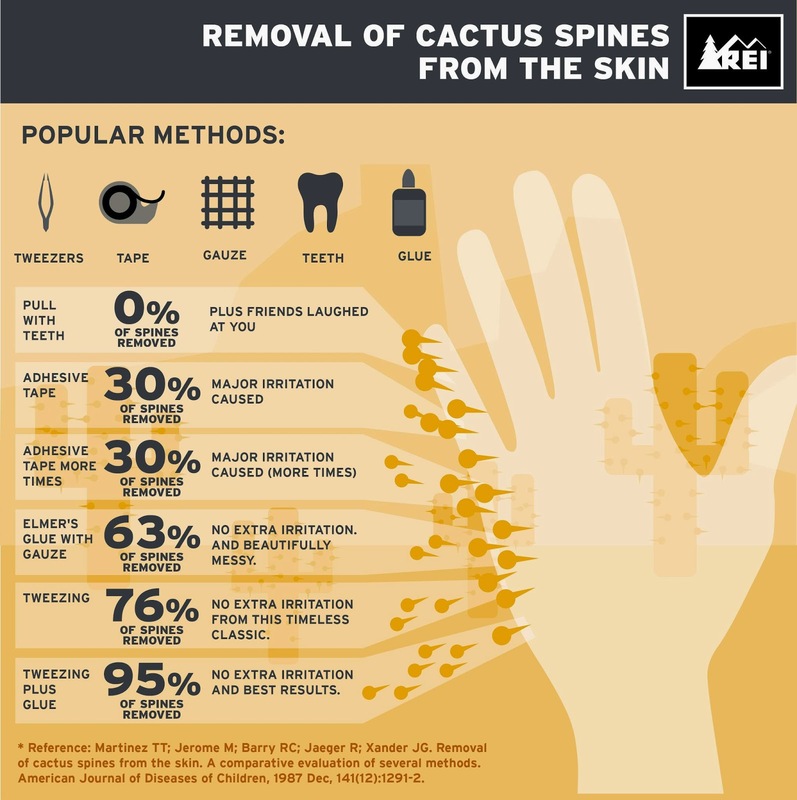 WEAR GLOVES AT ALL TIMES! Another tip that I read is to not touch your face when working with these. I didn't but I would have to agree that that is very good advice. Now that they are harvested there is still the matter of getting the demon glochids removed to be able to turn these beautiful treasures into jelly. I don't recommend the method I used, which was soaking them in water overnight to soften the glochids that SHOULD rinse off while being gently rolled in a colander. Note the word should. It appears the best method is fire. Sadly I have an electric stove so I had no easily accessible fire to burn the demon glochids. Having researched I assumed my soaking method would be safe and I could handle the pears. So very wrong. The very first one I picked up attacked me with more glochids than I can count. Yes, wear gloves. I used regular medical gloves and scraped each pear with a knife while running it under water. That worked. Well, mostly. What I'm saying is be careful. Those demons are deceptive. Alright, the glochids are removed. Now what? Good question. I was going to peel and deseed the pears to make jam. Holy purple mess!! Not to mention those seeds are little pebbles that didn't take to kindly to being removed from their cozy home. But look at that color! Isn't it beautiful? More research suggested a juicer. No peeling, just toss them in and the machine does the work. Yes! That worked and was so much easier. 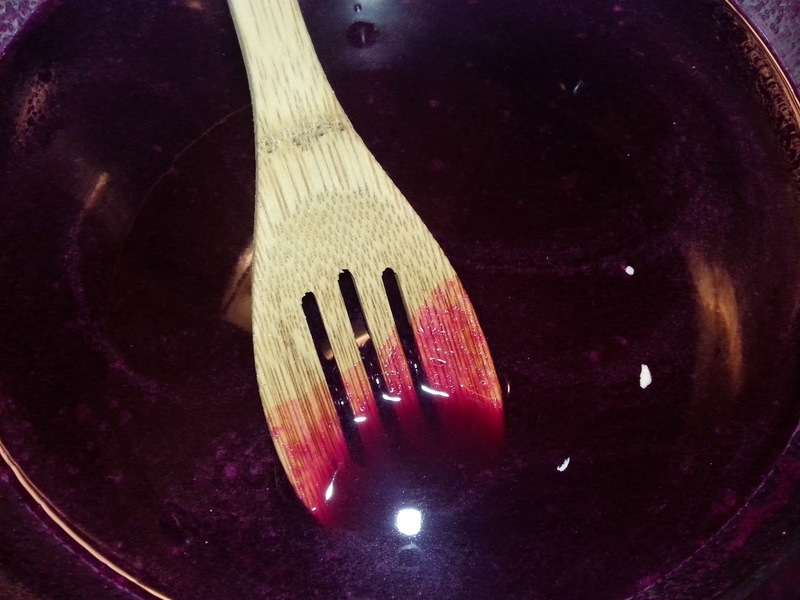 It was also at this point that I went from making jam to making jelly since there would be no flesh remaining. 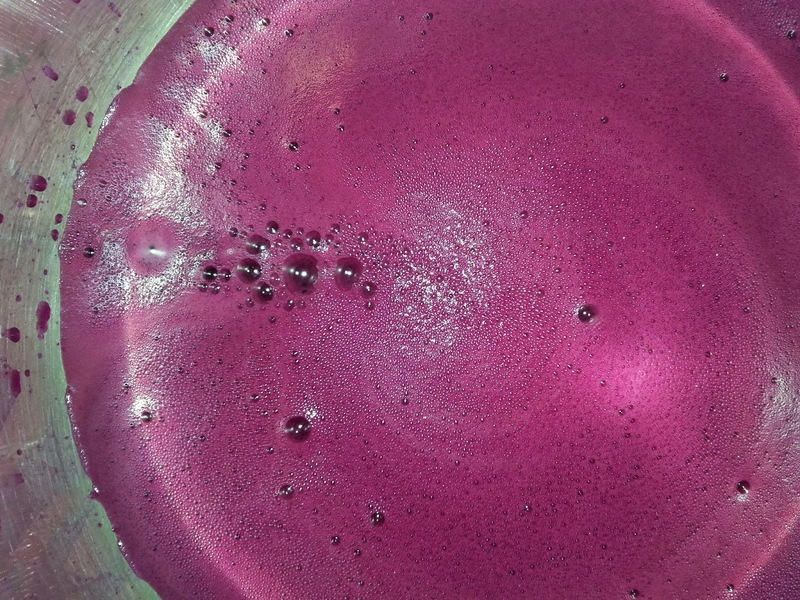 However, after the fact as I was reading more about extracting juice from the prickly pear I read a post about a side by side comparison of using a juicer versus using a food mill. 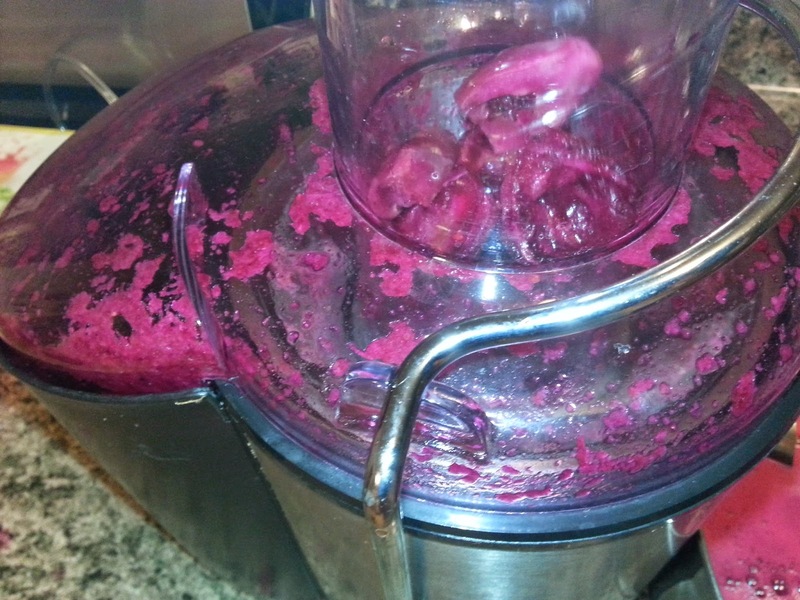 The juicer is likely to grind up seeds, taking away from the sweetness of the flesh of the pear. Too late for mine this time. Next time I will use a food mill and see how the flavor differs. 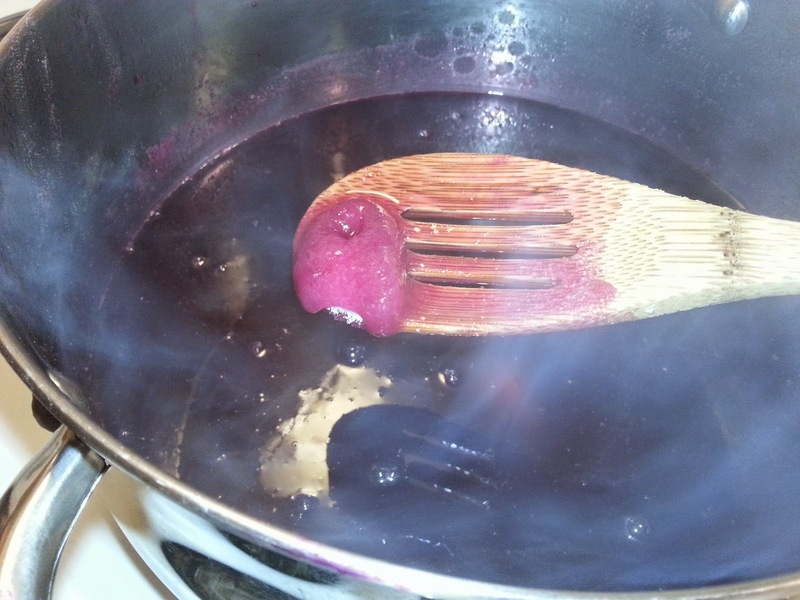 In a large pot add the juices, margarine and pectin. (The margarine is to guard against foam in your jelly.) Bring to a rolling boil for two minutes. 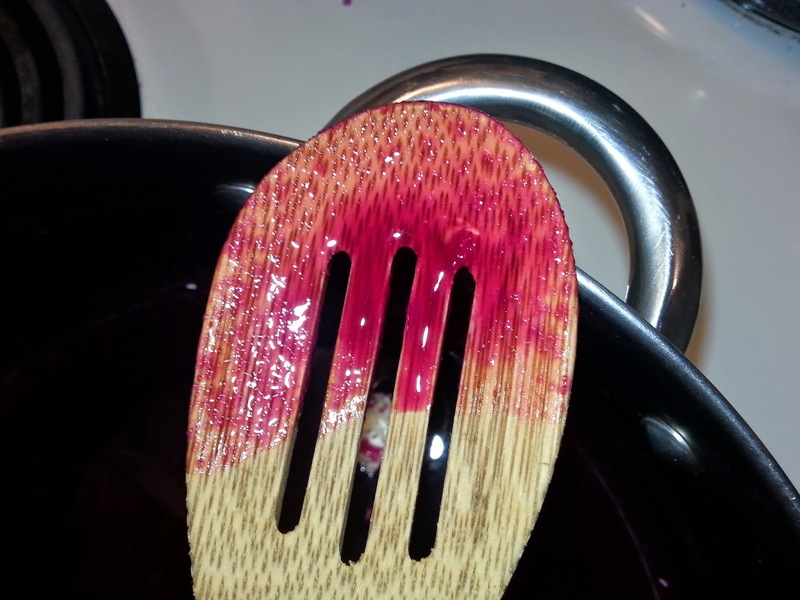 Wonder if my spoon will ever not be magenta stained? 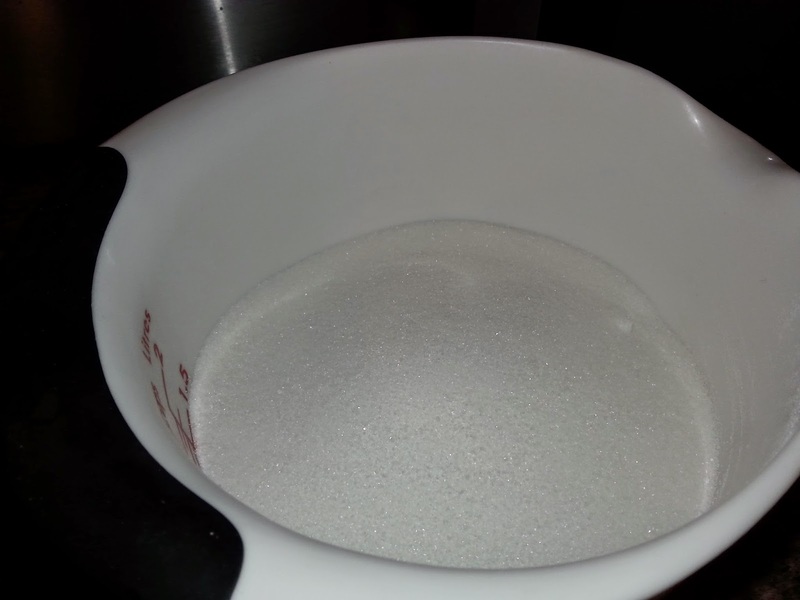 Add sugar all at once and return to a rolling boil for two more minutes. Remove from heat and fill jars and follow standard canning procedures for hot water bath. I ended up with 3 1/2 pints. I used the smallest jars so I had 12 pretty little jars of jelly and one half pint jar. To learn more about canning check out the National Center for Home Food Preservation. Funny little how to for removal of demons.